Adapt lubricating deodorant for ostomies, urostomies and ileostomies enables a new level of confidence and security in ostomy care with a proven odor-neutralizer and pouch lubricant that helps keep the pouch interior clean. Enables a new level of confidence and security with a proven odor-neutralizer and pouch lubricant that helps keep the pouch interior clean.Lubrication eases emptying and helps prevent pouch static and sticking. Deodorant works by neutralizing the odor; not a perfume or masking agent. 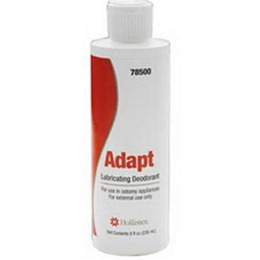 ADAPT Lubricating Deodorant was formulated exclusively for use in ostomy pouches. It won't degrade pouch seals, has been tested extensively for safety and efficacy, and is clear to avoid staining.